When drawing with any of the tools, you can access and change its properties in two ways: the Tool Properties view or Tool Properties window. The Tool Properties view displays the properties of the currently selected tool on the current layer you are drawing on. 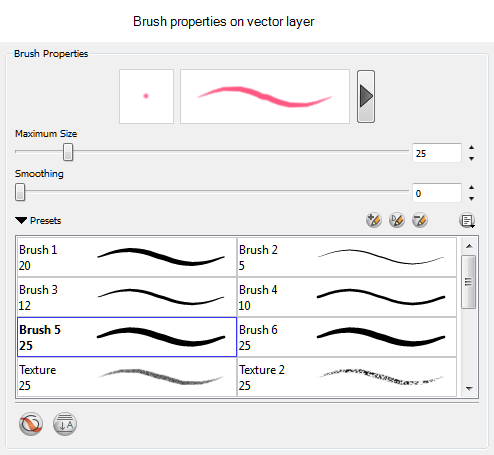 For example, if you are drawing on a vector layer, then all of the tools are available to you. If you are drawing on a bitmap layer, some tools are not available like the Pencil, Contour Editor, and Perspective tools. The Tool Properties window offers additional properties for the current tool. 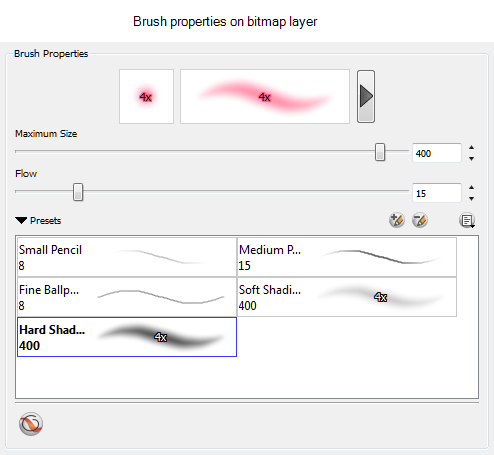 ‣ Brush tool or press [Alt]+[B]. ‣ Pencil tool or press [Alt]+. ‣ Text tool or press [Ctrl]+[Shift]+[T] (Windows) or [⌘] +[Shift]+[T] (Mac OS X). ‣ Eraser tool or press [Alt]+[E]. ‣ Paint tool or press [Alt] +[I]. In the Panel view, click the View menu and select Tool Properties. ‣ In the Tool Properties view, click the arrow button. The Properties window of the tool you are using opens.